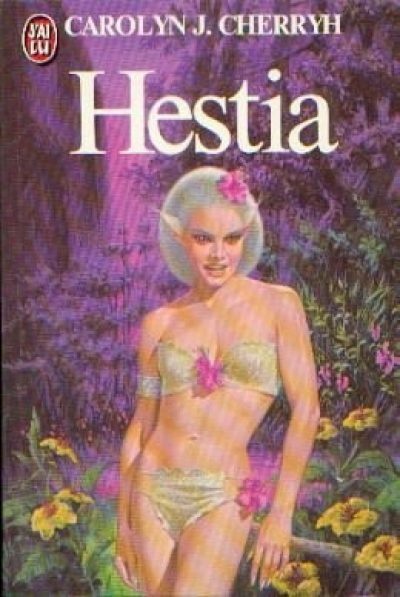 C. J. Cherryh’s 1979 Hestia is a standalone science fiction novel. The colonists who settled Hestia were warned that the valley on which they had set their hopes was not suitable. The settlers ignored the warnings and founded a community in the valley. In the century since settlement, the community has endured disaster after disaster. Each year the community is worse off. The colonists now believe that they have a solution: a dam to control the river. Only problem: they lack dam-building know-how. That’s where Sam Merritt, our protagonist, enters the narrative. Sam Merritt, contract in hand, arrives to build the dam that the colonists are convinced will solve all their problems. After a quick survey. Sam concludes that the colonists are deluded. They would be better off if they were to give up on Hestia and accept transport to some other world. Hestia has natives. The settlers have long suspected this, though they’ve never gone the extra mile to confirm it. These natives would be forced to move if their land were to be flooded by the dam’s reservoir. The native Hestians are determined to keep that from happening. Does Hestia have valleys that aren’t disaster-prone? Why haven’t the settlers moved? Why haven’t other settlers been plunked down on Hestia? Perhaps Hestia is an only marginally inhabitable planet that has been ignored by more savvy colonists. but close enough to human for native-girl Sazhje to think Sam is cute. If this book were set in the Union/Alliance timeline, I would blame the qhal. However, this book seems to have its own, unique, setting. A preference for aliens who are humanoid mammals may just be a Cherryh quirk. Given that the Hestians are so very humanoid, it’s hard to believe that reports of their existence wouldn’t have been followed up by the human settlers living in the same damn valley. Once their existence had been confirmed, it wouldn’t have been hard to establish diplomatic relationships. Once Sam starts trying to talk to Sazhje, the native who takes an interest in him, the two quickly establish a rudimentary shared vocabulary1. Readers more familiar with Cherryh’s later work may find this novel surprisingly straightforward (characters and prose alike). Consider this a baseline from which further elaborations evolved. 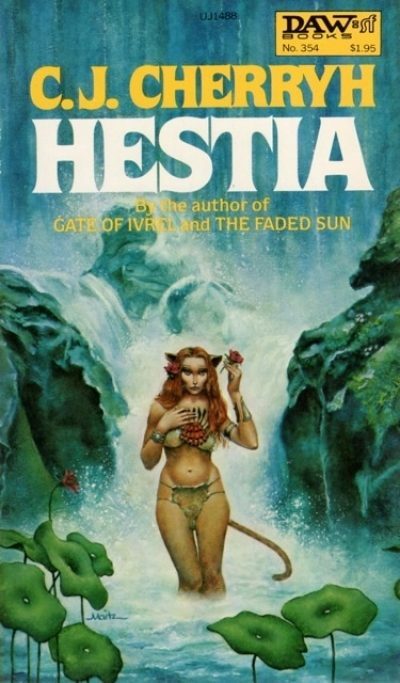 Hestia appears to be out of print. 1: Sazhje learns a bit of English; Sam doesn’t learn Hestian. As I recall, who learns whose language in first contact situations could go either way in Cherryh stories. I think I remember the French cover lady from Star Trek... or I just have a "type". But I hoped that would be specifically human.